To make a presentation more dynamic and interesting, sometimes presenters insert some websites into their PowerPoint slides. However, it is very common to see these presenters normally insert the print-screens of these websites instead of inserting the complete website into the slide. Alternatively, they will minimize their slide show and go to the browser to browse the websites to show to audience. Inserting the print-screen images somehow defeats the purpose of showing a dynamic presentation and makes teh presentation become less attractive. If your presentation requires you to show some websites to your audience, probably you can consider adding in LiveWeb, a useful plugin into your Microsoft PowerPoint. LiveWeb is a tiny add-on to Microsoft PowerPoint which allows users to insert web pages into their presentation slides and show these web pages without leaving the confines of their PowerPoint slide show. Compatible with PowerPoint 97 and above, this tiny application is user-friendly and doesn’t require any coding to make it work. Besides inserting a real online website, users also can insert documents from their local drive by specifying the relative paths. LiveWeb will also look for files in the presentation folder if the files have local drive information and cannot be located at the location specified by the user during the slideshow. LiveWeb is a FREE add-in to Microsoft PowerPoint. It is not a new tool for some users might already have used it in their presentation. Anyway, others who intend to give it a try can download it via the direct links here (PowerPoint 97-2003 users and PowerPoint 2007 users). 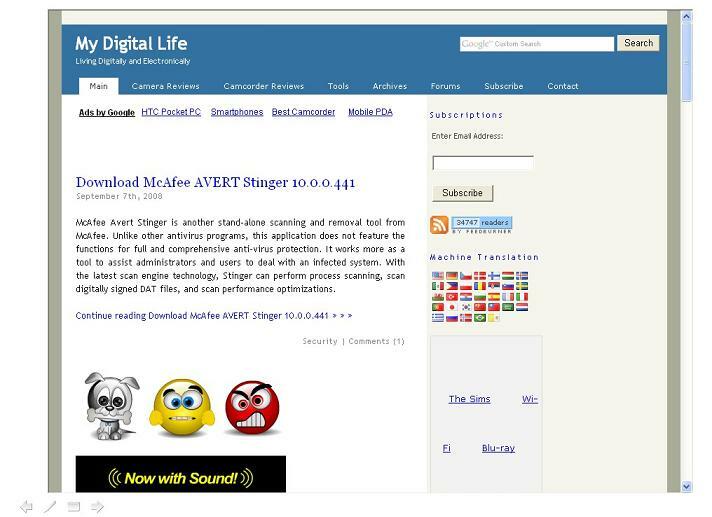 The downloadable file is a small zip file namely LiveWeb.ppa. 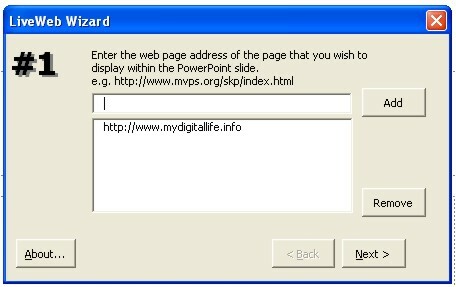 Users can double click the file to open a new PowerPoint presentation template. Users will notice that there is a new item, Insert/Web Pages in the Menu bar. Click on the Insert/Web Pages and type in the URLs for the list of web pages that you wish to create. LiveWeb will create slides with web browser controls embedded on the slides. The web pages will be displayed during the slide show and refreshed at real-time. The add-in should always remain loaded for the real-time update to work. LiveWeb is quite helpful and help presenters significantly in making their presentations more interesting and professional. It helps the presentation to run more smoothly at no cost extra to users. 2. Click on Tools|Add-ins to bring up the add-ins window. 3. 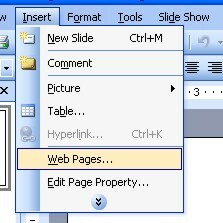 Click on Add to bring up the ‘Add New PowerPoint Add-in’ dialog box. 4. Navigate to the folder where the contents of the zip file was extracted and select ‘LiveWeb.ppa’ and click on OK.
5. You might be prompted with the macro virus warning. Enable the macros. When the Add-in is properly loaded, it will display a ‘X’ against the add-in name. 6. That’s it. You have successfully loaded the add-in. Now put it to use. If you cannot load an add-in in PowerPoint 2000 or later, check the macro settings (Tools | Macros | Security). It should be set to a security level – MEDIUM, prior to the add-in being loaded.